Let’s make a reflection about the expression “Djat Ra” belonging to the Opening of the Mouth ceremony of Ancient Egypt and that we saw in a previous post. It appears in a resurrection scene in the tomb of Qar; according to the inscription the mourner and the embalmer are making the “Djat Ra“. Many scholars considered that with this expression the artist and the scribe indicated literally the gesture that both were making. However, the expression “Djat Ra” also meant “feeding” [Wb V, 514] as the gesture of taking the mouth to the food. It could be related to the funerary offerings, which would grant the food for the dead in the Hereafter. But, it could also refer to gesture of the mother taking her breast to her baby’s mouth for nursing him. In fact the mother approaches her hand to her baby’s mouth for moving her breast closer. 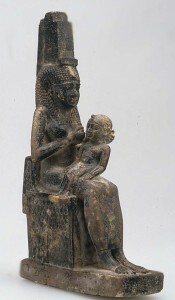 The woman nursing her baby is a very common icon in Egyptian art. We can find many examples in the private sphere of reliefs and statuettes of nursing women. This image was also usual in royal imagery of ancient Egypt. Not for nothing we can read from the Pyramid Texts of Old Kingdom how the Goddess Nut nurses her baby Osiris, assimilated in this case to the dead king. This “written” image belonged to funerary texts, which granted the resurrection of the corpse. So it had a relationship with the new life. Also we find easily in some royal funerary temples the image of Hathor (as woman or as cow) nursing the king. In this cases it was a way of legitimating the divine nature of the pharaoh, but also, due to its location into a mortuary construction, it was also related to the eternity of the sovereign. 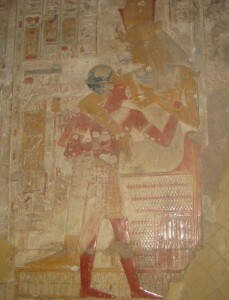 Isis nursing Horus. Late Period. Photo: Metropolitan Museum of Art of New York. 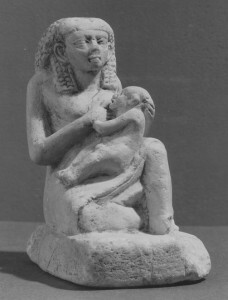 But the most known image of a nursing goddess was the one of Isis nursing her baby, the god Horus, especially in statues from the late period. Isis is depicted bringing with her hand closer her breast to the mouth of Horus, so she is feeding her son. Djat Ra could be an ancient Egyptian expression for referring to the fact of approaching the breast with the hand to the baby’s mouth. Such a typical scene in the ancient Egyptian mortuary iconography was not unjustified….